E: So before we start, B, I want to ask you about meeting the show’s creators! B: I got to briefly introduce myself to [FOTB showrunner] Nahnatchka and tell her about my capstone project [for my journalism degree]. I asked if I could interview her about FOTB and she directed me to her assistant! I’ve contacted him and am waiting to hear back. Unfortunately, I didn’t get to discuss anything at length with her. But it was a great forum because it featured her and several LGBT activists and performers, including Rex Lee, who plays Oscar! K: Aahhh that’s so cool! E: Ooh cool! Let us know how the interview goes if you get to do it! Ok, let’s get started? K: So this episode, “License to Sell,” features Jessica struggling with the idea of not being the best realtor in Orlando, which leads to her continuous avoidance of the realtor test, and her hiding of this fact from her family. I guess we can start with this, since it was the A-plot of this episode. What did you guys make of it? B: The episode adds more depth to Jessica’s already strong character. We’ve seen her as kind of a Tiger Mom, and as a proud and sometimes overly ambitious individual — but this episode humanizes her in a way that previous ones didn’t. It shows her insecurities about her ability to pass the realtor test and reveals her mentality of not wanting to let her family down, despite masking it as fear of not being the best. K: Yeah, I agree. It seems like the writers are attempting to flesh Louis out more, but aren’t really sure how to develop his character. I liked the success perm callback, but to me his subplot in this episode wasn’t really interesting, especially compared to Jessica’s. In fact, Evan and Emery’s treatment of the salon chair as a starship was the only thing that made this B-plot relevant/funny to me. And speaking of uninteresting storylines…I was disappointed with where they took Eddie’s storyline this episode. I like that they kind of humbled him at the end by making him realize he doesn’t need to bend over backwards to impress Nicole, but I really really wanted him to go see Shaq!! Even if it turned out to be an imposter, haha. “We forgive you for Shaq Fu” was such a throwaway line but one of my faves of the episode. B: I agree that the creators are unsure of exactly how to mature Louis’ character, especially because he usually takes a backseat to Jessica. This is even seen in his interaction with Eddie. He’s predominantly the one giving him relationship advice, hence why Eddie ends up getting some alone time with Nicole. The “Fajita Man” episode was such a solid bonding moment between the two, but since then, I feel like their dynamic hasn’t been as strong. And it was almost out of character or Eddie to not see Shaq! I really wanted him to go too. And yeah, it was humbling, and that’s kind of the point that Eddie realizes he doesn’t need to go to those lengths, but his “Idgaf” nature usually takes precedence over his crush on Nicole. At least their more extended interaction might curtail any further development of a relationship. E: I’m hoping that since the show has taken Eddie to such lengths in his pursuit of Nicole, they’ll move away from that trajectory soon. Wouldn’t it feel a bit repetitive for him to keep pursuing her so one-sidedly, especially since in this last episode, it seems like Eddie started to realize that pursuing Nicole so blindly isn’t that fun or rewarding? I hope it’ll move more toward a friendship, but I guess we’ll see. Ugh Louis’ relationship advice is always the worst, by the way. Dogging a girl is hardly the way to go…at least the show didn’t really reward Eddie for taking that advice. K: Right. The thing is, though, I don’t know how we as audience are “supposed” to perceive Louis. Are we supposed to recognize that his advice is bad? Or take it as Eddie does? I feel like the show is sometimes confusing in that way, but maybe that’s me overanalyzing it, lol. In the end, this episode was so-so for me — I liked that they went for a bit of a darker tone with Jessica’s storyline, but the Louis and Eddie storylines were just…meh. B: I think his advice on the relationship front is played for laughs and not given too much thought by the writers. But as Esther said, Eddie’s realizing that his pursuit of Nicole is increasingly futile and less fun, highlighted by their alone-time interaction. It seems the show is in fact moving away from that relationship trajectory, which paints Louis’ advice as ineffective. Now let’s look at “Blind Spot!” This episode drew a lot of attention because it spotlighted the LGBTQ community, bringing in a gay Asian character (who will be recurring if the show gets renewed for a second season) and presented other gay characters. However, the creators of the show took a stereotypical approach. Oscar is a flamboyant and effeminate “Gaysian,” and the lesbians at the bar are butch and rowdy. While these over-the-top portrayals are necessary to the plotline of Jessica’s “gaydar” being broken, are they problematic? Should they have been more nuanced? E: The way the show played gay stereotypes for laughs was definitely weird to me — especially the way Louis talked about “gaydar” as if there’s a checklist of traits that reveal homosexuality as self-evident. I’m thinking of the way he would say, “Oscar is auditioning for Aladdin on ice!” as if this couldn’t mean anything else but that Oscar is gay. I mean, I know it’s a sitcom and it doesn’t have time to be totally subtle, but still. I did appreciate the casting of Rex Lee, an openly gay actor, in this role. B: Strangely enough, the episode got a lot of support and laughs from the LGBTQ community at the live L.A. community viewing I went to. The episode had its moments — for me, more so with Eddie, Emery and Evan’s subplot — but I didn’t catch myself laughing out loud when it came to the “gaydar” A-plot. I actually thought it was problematic because of the one-sided portrayals of gays and that implication that there’s some kind of checklist, like you said Esther. I asked Nahnatchka about why the writers chose to portray Oscar the way they did, and she said that it was simply because of the “gaydar” plot and how they wanted to make it so evident that he was gay for Jessica’s sake. No one on the panel seemed to have a problem with the way they characterized Oscar, agreeing that it was integral to the plot. Nahnatchka did say that Rex Lee was the only actor they considered for the role. So they may have already had him in mind when shaping Oscar. And Rex was saying something about his actually being gay allowed him to give the character an authentic representation… but he’s one gay man, so it’s still a one-dimensional character to me. K: Hm. That’s a weird way for Nahnatchka to respond to that question, B. I appreciate the inclusion of LGBTQ representation — especially with the role pretty much being written for Rex Lee, by the sound of it — but I do think there’s a way for this to be integral to the plot but not one-dimensional and stereotypical…which, as y’all have pointed out, this storyline totally was, unfortunately. 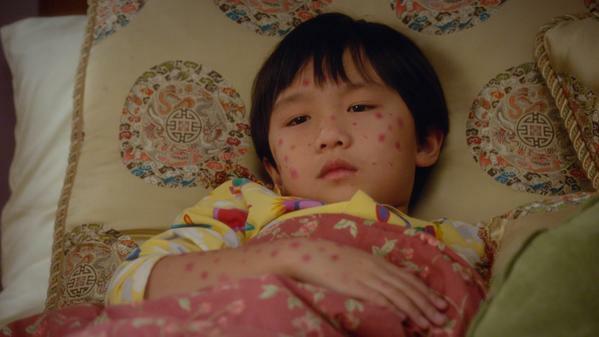 On the bright side, though, I do appreciate how this episode brought the three brothers together through the chicken pox/science fair B-plot. I’ve always found the relationship between Evan and Emery to be really endearing, so it’s nice to see Eddie become a part of that adorable mix. 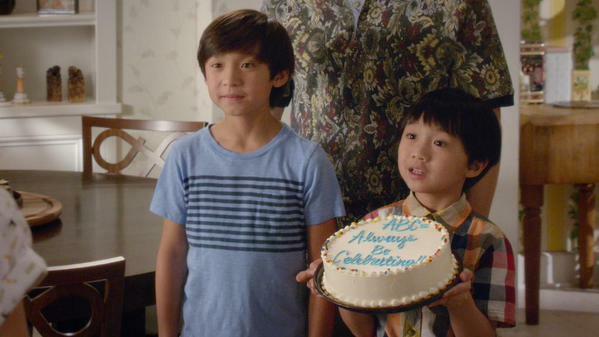 I’ve been hoping they give the other two brothers more to do, so it was really cool to see them not only have their storyline interwoven with Eddie’s [and later, even with the A-plot]. The use of horror tropes was simultaneously cute and hilarious, as well. B: Yes, the brothers’ subplot is super endearing and fun, and it’s great to see all three of them on the same page. I read an article that mentioned something about how the kids should have interacted with Oscar so that the family has to address his “gayness” to them, but I actually like that they didn’t do that. It shows that the Huangs are just very accepting of Oscar’s gayness and that it’s never questioned or looked down upon. And agreed! I didn’t think the A-plot was hilarious, but I do think that seeing a gay Asian character on TV — especially one played by an openly gay actor — is a positive thing overall for representation. While Oscar was a fairly cliched character, one of the panelists, Erin O’Brien (lesbian artist and activist), said that FOTB is kind of groundbreaking in that it “queers” everything we know about the world. She mentioned how Jessica’s character rejects the suburban housewife role and sends Evan to deal with the neighbors’ gossip. She said that kind of has a gay subtext. Emery has two “girlfriends,” so that has a poly subtext. How do you feel about that interpretation? K: I guess I’m a bit grouchy because I’ve been spoiled by other media with more nuanced LGBTQ representation, haha. But as you both pointed out, the inclusion of Rex Lee and the Oscar storyline was positive, even if not perfect. I like that interpretation of FOTB “queering” our views. I think Constance Wu said in the Times article I referred to a few weeks back that FOTB challenges the “anglo-heteronormative” tendencies of American TV? Such a great term! I’m not too sure about Emery being necessarily polyamorous, though…he’s still young and that aspect of his character is often played for laughs or shock value. But I do like that everyone at school seems to love him — that’s a big departure from the ostracized Asian nerd trope. B: I don’t think she meant it as the characters actually being gay or polyamorous — just that it’s symbolic of more queer relationships? I can’t speak for her, but that would be my guess. K: That’s a really great reading, E — I feel like Eddie’s obsession with Nicole definitely inscribes some heteronormativity back into an otherwise generally subversive narrative, but as you both have mentioned, that part of his story is pretty much over [or should be!]. Overall, I think episode 10 balanced out episode 9 pretty well, in that it was a much stronger followup and nicely explored the dynamics of Louis and Jessica’s relationship, through the inclusion of Oscar and their ultimate acceptance of his sexuality. The introduction of Oscar also served as a nice way to bring the family together in a heartwarming without feeling heavy-handed. B: So true! Oscar’s homosexuality is very accepted by the Huangs. Jessica doesn’t freak out when she finally realizes that Oscar is gay — she’s just upset that Louis isn’t more jealous and protective of her. And Louis, when Oscar reveals that he thought they dated, reacts warmly and without a trace of homophobia. So I like how that dynamic was handled. K: I’m also glad that this show is being well-received by the general public — IMDB is not the best metric for this, but FOTB has an 8.3 on it, which makes me really happy. How did you feel about the last couple of episodes? 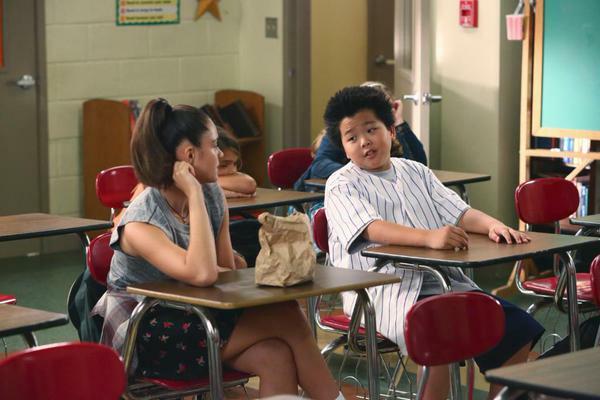 Fresh off the Boat airs Wednesdays on ABC.